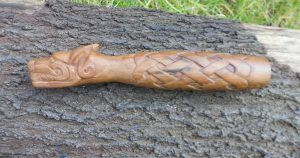 This knife handle was carved from oak that originally grew on the Quantock Hills in Somerset. It was commissioned by someone who intended to fix it onto a ceremonial blade for use in pagan rituals. 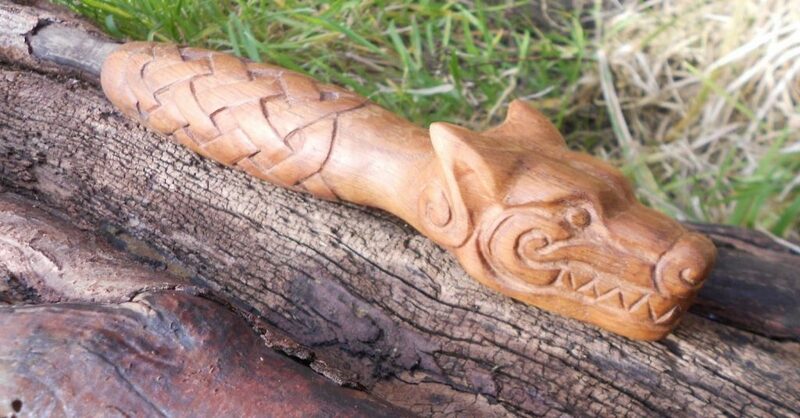 The Norse-style wolf’s head on the pommel of the handle is based on a piece of jewellery that the client particularly likes. It was an interesting challenge to mark out the knot work accurately on the handle, as it sloped from the centre towards each end. 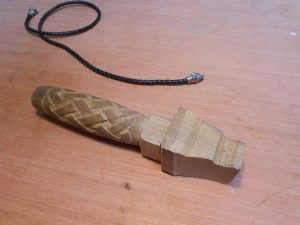 The grip was initially turned on a lathe, then the central hole drilled, the pommel was roughly shaped and then the knot work carved with a knife. 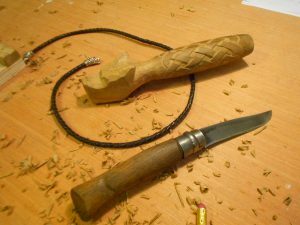 I felt that this knife worked finish gave more of an authentically ‘Viking’ look to the whole thing and it was also very comfortable to hold, as the handle was held in my hand whilst whittling the different designs. I used a selection of carving gouges to produce the wolf’s head, as they suited the shapes that needed to be made more than a knife would have. The oak was finished using tung oil, as it is more natural and contains less additives than many other finishes. 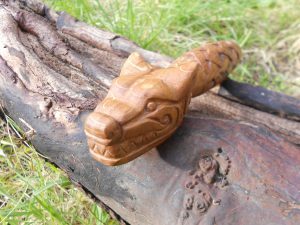 I have carved several other interesting knife handles. If you would like to see more, go to the page on Carved knife handles.